I only got one when Etude House had their year-end sale last year to do the swatch and to see how great the line is. It never fails, trust me! Got the one in #12 which is Red. I don't normally use lipliners as I go immediately on lipsticks and tints. But when I used this, it was so amazing I wanted to purchase the entire 50 shades. I used this as a liner and lip color. I got #12 and the shade was in red. I personally got the red one 'cause I was thinking of using it as a lipstick, lip liner and a blush. More on the lip part though. The product includes a sharpener at the bottom. You just have to sharpen slowly and carefully to avoid breaking the tip of the pencil. Take note that it's not as hard as a normal pencil. The tip was soft so better be careful. My lips isn't shaped perfectly. 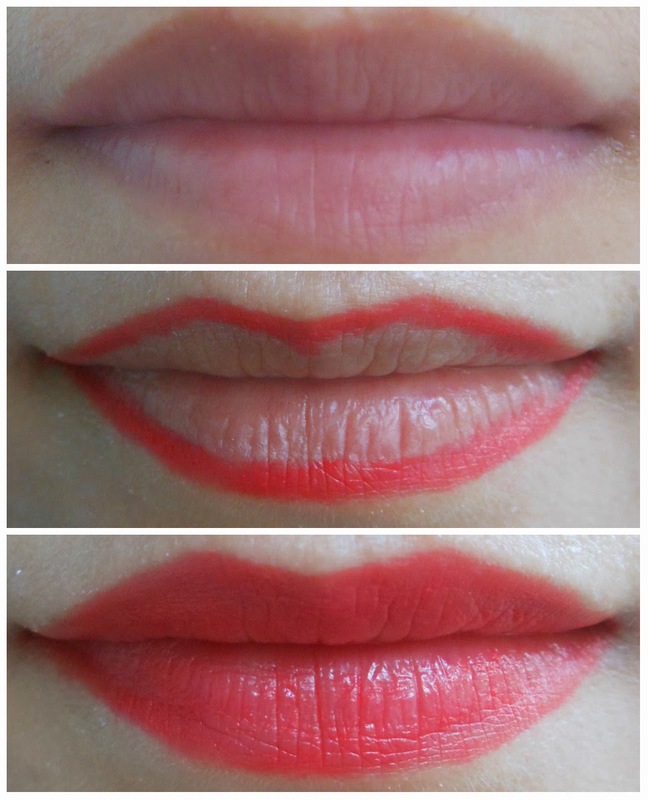 Upon using this, you can make the adjustments on how you want to shape your lips. You can make it look voluptuous and pointy among other things. Plus the color is so nice! The product was so creamy and glossy at the same time. Perfect for everyday look! Available in 50 shades. You'll have a lot of options. Rich color in a single drawing. Kinda expensive but it's so worth it! What is not to love on this product. Imagine you can paint your whole face with just pencils. Whoever invented this is a genius! Good job etude house for bringing amazing and superb products for us! What do you think about this product? Have you tried Play 101 Pencils? I am getting more and will update you soon! Cheers! It looks like you got tons of products from the year-end sale. Too bad Etude House is far from our place. What made you buy this lip liner anyway? The lip liner looks pigmented. How long does this last? Not really a ton, just a few. I bought this pencil because after watching Pony's tutorial, I know it has a lot of uses. The pencil as the lip color and liner lasted for 3 hours with me then disappeared a little after drinking and eating. It's just one coat though. I think you need to color it fuller for longevity. Are you referring to the retractable one? I actually just bought one myself. I should visit an Etude shop soon. I like the shade that you got ( good pick! ) and I can't wait to see the rest of Play 101's 49 shades. True sis! I also can't wait getting more from the line. If I know someone who's going to Korea, I will definitely ask them to buy this line for me. Products there are almost half the price. Oooooh... Anything at Etude, I love! Especially, mascara and lipsticks! Im almost done with my mascara so if I swing by the shop, id look for this real soon! True sis. Guess we're soul sisters! I love Etude among all the Korean beauty shops here in our country. They have the cutest and daintiest packaging on Korean products pa! So pink!!! Nooo! Hahaha.. Make up pencils are far way different than writing pencils. Other people not exposed to make up think that it's okay to use pencil on the face. Nah! I love their pencils too and there are so many colors to choose from. Kinda expensive for a pencil but I love the outcome that it gives. What shades do you have sis? I am definitely getting more of this. Perhaps if there's a SALE or if I happen to know anyone who will visit Korea. This is a very interesting product by Etude House huh. Does it come in other colors? There are 50 shades to choose from. My mom warned me against using lip liner, but I think this one debunks the myths that it will make you look older!